Warwickshire’s penultimate home fixture in the Premier Division of the BDO Inter County Championships produced something of a shock result as they lost to Hampshire a game they were fully expected to win. The ladies ‘B’ got the weekend off to a great start when they beat their counterparts 4-2 with Donna Pinch lady of the match with a 3-1 win over Dawn Simmonds giving her a 17.50 average. Mark Strong took the men’s ‘B’ team award averaging 26.37 in his straight 4-0 win over Steve Musson. Sunday’s games saw the ladies ‘A’ lose 4-2 with Sue Gulliver (23.48) making it five match awards in seven games when she accounted for Abi Jurd with a 3-0 result. The men’s ‘A’ made it five wins and one draw in their seven games so far when they won 7-5. Nigel Heydon with a superb 31.00 average made it two consecutive man of the match awards when he beat Steve Phipps 4-1. The overall result was a 19-17 win for Hampshire leaving Warwickshire sixth in the table on 134 points six more than their victors who are two places below them. With all of the domestic issues sorted the Four Oaks and District League are running down their season with various cup matches the latest of which was the Coronation Shield and Norman Day Cup. League champions Royal Sutton Flights added the Coronation Cup title to their trophy hoard for the season with a 9-6 win over The Boot in a game that produced 38 scores of a ton or more. Golden Hind outscored second division champions Pint Pot Flights in the Norman Day Cup but it was Pint Pot who got the early 3-0 lead. Golden Hind fought back to go 5-4 up but their opponents battled tenaciously and went on to clinch a close 8-7 win in the final leg of the last game. M.Bagnall (Pint Pot Flights) hit his second maximum of the season and T.O’Kereke (Golden Hind) his first. It was cup semi-finals week in the Forest of Arden Winter League, first the Rose Bowl in Journeys End and Highwood KB, which respectively placed second and third in the table squared up to each other in what was expected to be a close game and that was exactly how it turned out as Journeys made their way into the final with a 5-4 result. The final will be an all Journeys End affair after Journeys End Flight beat Greville Arrows 6-3. In the Rose Bowl Consolation Cup there were mixed fortunes for Highwood as Highwood Arms won 6-3 against The C’s and Highwood Exiles lost 8-1 to Kingshurst Knights. West Heath have been ousted from their number one spot in the Kings Norton League after surprisingly losing 5-2 away to E57 who are placed fourth on 24 points. The former leaders drop to third place with Rubery RBL taking over the leadership following their 4-3 win at Bournbrook to put them 28 points plus a game in hand on both second placed Avenue Social and West Heath, Avenue winning their fixture at Kings Norton Ex Serviceman’s Club 5-2. The Henley and District League have been kept busy with cup finals, no fewer than five of them. The Singles title went to Andy Foulkes who beat Dale Evans in the final. 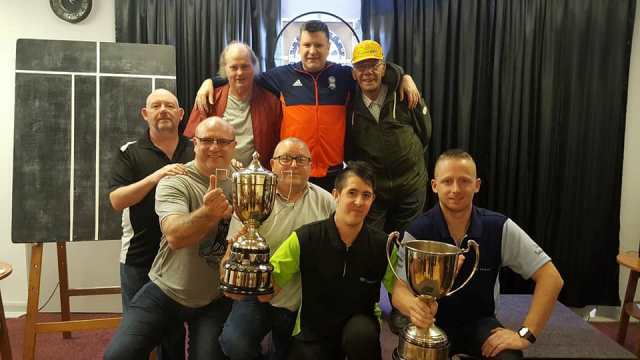 Foulkes then made it a fabulous double when he won the Doubles Knockout with his partner Lionel Deeley, Paul Fackrell and Aidrian Whadcoat were runners up. Fackrell and Whadcoat then also made it a double win by taking the Captain and Secretaries title with a final victory over Dave Tabberner and Dale Evans. The Ladies Singles title went to Ruth Gwilliam with Mandy Morgan losing in the final and to round off the five finals Paul Fackrell added to the two titles he had already won by pairing up with Mandy Morgan to win the Mixed Doubles title beating Adrian Whadcoat and Annie Bailey in the final. A reminder that the league will be holding their delegates meeting at Wootton Wawen Social Club, Alcester Road, Wootton Wawen, B95 7AY on Monday 16th April at 8.30pm, anyone interested in entering a team for the forthcoming season should attend this meeting, old and new teams are cordially invited to attend. Biggest win of the week in the Winmau Centre Monday Night League was a huge 48-0 by The Untouchables over Three Men And A Lady putting third in the table Untouchables on 354 points just three short of second placed Above Average who won their tie with Here For The Beer 37-11. Misfits hold on to pole position with 364 points after a 35-13 win against Keep It In The Family. There was a rare win for Unleashed Warrior, a 25-23 success against Make Mine A Double, only the second win in ten for the Warrior. The Gate have moved up one place from the bottom of division one of the South Birmingham Winter League despite losing 5-4 at home to Coleshill Social as The Trident lost 7-2 at home to league leaders Erdington Members Club and now trail Gate on average, Erdington remain eight points clear of the field. In the second division leaders Iron Horse stretched their lead to four points after they won 6-3 at Toby Jug and second placed C’s Arrows surprisingly lost 7-2 away to The Kingfisher who are six points behind them. The Warwickshire Youth squad played hosts to Merseyside in their latest inter county fixture and with another superb performance with wins in all three sections recorded an overall 10-5 victory. Playing at the Parkstone Club, Coventry the Under 18’s won 4-3 thanks to wins from Jordan Ainsworth, Lucy Keyte, Jake Liggins and Matthew Cain while supplying the straight 3-0 win for the Ladies were Skye Pickard, Laura Bowley and Courtney Hine. Rounding off the win with a 3-2 verdict in the Under 21’s were Tom Mills, Lewis Bayliss and Charlie Symons. Warwickshire now top all three divisions and with just three more fixtures to play are odds on favourites for the championship title. Leader of the Erdington Red Lion Double Top League Will Naylor didn’t play in week 22 and his nearest rival Dean Bayliss took the opportunity to reduce the arrears by winning 2-1 against Ryan Barritt and Matthew Cain. However despite the two wins Bayliss is still eight points short of Naylor who now also has two games in hand. With 3-0 wins over Richard O’Grady and Stuart Larvin third placed John Frost has reduced the deficit on Dean Bayliss to six points and opens up a three points lead over fourth and fifth placed Lewis Bayliss and Jim Frost. Wins in the opening seven games for Kristian Wharton in the Winmau Centre Thursday Night Champions League has taken him into pole position with 39 points while currently second is Adam Quinton who has played six and won six to give him 32 points. Reigning champion and winner for the last four seasons Mick Baker is at present in ninth place on 20 from five games. A 6-3 win for Highwood was not enough at Saracens Misfits in the Shirley and District Monday Night League and has seen them lose outright pole position, they share the top spot with Dunky’s Boys whose 7-2 win at Legion Royals has put them level on points and average with Highwood. Third in the table Red Lion with maximums from Mark Henderson, Steve Sidwell and Mick Bown beat Blue Bell 7-2 and stay within two points of the leading duo. There were big wins for the top three teams in the Small Heath League in week 18 with leaders East Birmingham Allotment Holders Association winning 7-2 against Sheldon Marlborough Arrows to stay four points ahead of second placed Heartlands Club who won 8-1 at Cob’s Bar and in turn are ten points to the good on third in the table Sheldon Marlborough Flights who had a 7-2 win over Emerald Club. Heartlands Dean Bond was in terrific form as he checked out in six scoring darts. After failing to break with his first set of darts Bond then broke with 160 and checked out on 141 for an actual nine darts leg. He then followed that with an eight darts leg breaking with 101 scoring 100 and finishing on 100. The Office have overtaken Queens Head in division one of the Pip Club League, taking over the top spot with a 7-2 win over Dolphin Wanderers, they are level on 16 points with Queens Head but with a superior average. Old Liberal House continue to lead division two with 14 points four more than second placed Pip Club and in the main division its Queens Head who lead the way on 32 points from 17 games with The Office breathing down their necks just two points short with a game in hand. After a convincing 8-1 win over Pensnett Liberal Club in the Brierley Hill Monday Night League, Dudley Ex Serviceman’s Club ‘A’ have made it ten wins in as many games and have a two points advantage over their nearest rivals Bulls Head who were 6-3 winners at Roebuck, Roebuck being the only team to lose in the top five. Third in the table Mount Pleasant handed out a 9-0 whitewash to their hosts Limes Club to remain two points behind Bulls Head. The Netherton Thursday Night League played the second leg of their League Cup semi-finals and with an aggregate 10-8 win over Townsend Club, Bulls Head won through to the final. League leaders Dudley Ex Serviceman’s Club’s game with White Horse went to a sudden death play-off, Bobby Carr just edging out Liam Evitts to book the Serviceman’s place in the final. The final of the Shadow Cup will be between Delph Bell and Riddins Tavern after Delph Bell beat The Crown 12-6 and Riddins won 11-7 against Fairfield. Ashwood and Gornal Labour Club have swapped places in the Sedgley and Gornal Tuesday Night League, Ashwood beating Fellows Club 7-2 to move into third place on 34 points while the Labour Club lost 5-4 away to leaders Old Bulls Head and drop to fourth with 32 points. Top of the table Parkes Hall held on to their two points lead over Old Bulls Head with a 7-2 win away to Red Cow. To complete the domestic fixtures in the Brierley Hill Friday Night League three rearranged games were played in which Miners (Wollescote) won 5-2 against Pensnett Welfare Club ‘B’ and there were 7-0 wins for league champions Brickmakers Arms ‘A’ and runners up Netherton Cricket Club ‘A’ against respective opponents Fox Inn ‘A’ (Lye) and Britannia, the results did not affect the final table in any way. Brickmakers Arms ‘A’ suffered their first defeat in eight games in the Silver End Sunday Morning League and at the same time lost their position at the top of the table as they dropped to third place on 19 points the same number as second placed Woodside and fourth in the table Brickmakers Arms ‘B’. Replacing Brickmakers in the number one spot is Netherton Cricket Club who beat their hosts Glasscutters 7-1 to put them on 20 points. Reigning champions Woodside won 5-3 against Three Crowns. An impressive 7-2 win for The George leaders of the Rowley Monday Night League against Cradley Liberal Club who drop one place to fourth, maintains their 100% win record after ten games and keeps them two points ahead of The Bell who had a close 5-4 home win over fifth placed Ivy Bush. The Hilltop Friendly Tuesday Night League played the quarter finals of their Black Country Windscreens Trophy and winning through to the semis were Dewdrop ‘A’, Waggon and Horses, Dewdrop ‘B’ and Horseley Tavern who provided the shock of the night by beating league leaders Tipton Sports 5-2. Just one rearranged fixture played in the Camp Hill League which saw fourth in the table Tyseley WMC beat third placed White Swan Nomads 4-3. The Sheldon and District Winter League played their Singles Knockout down to the last sixteen players at two venues Meadway Sports and Social and the Crown at Olton. Results are not in from the Crown but winning through from Meadway were Dean Young (Mackadown Social), Pete Yardley, Ian Spencer (Dunky’s Boys), Dave Howlett, Dave Humphries (Sheldon Marlborough Cricket Club), Shay Darby (East Birmingham Allotment Holders Association), Kris Green (Pirates), Sean O’Donnell (Sheldon Dukes). The Sheldon and District Summer League will be holding their AGM at the Meadway Sports and Social Club on Sunday 15th April at 10.30am. All teams old and new must complete an application form to be presented at this meeting. The Winter League will also be holding their meeting on the same day. The Cradley Tuesday Night League played their Singles Knockout down to the last 32 and in the draw for the next round will be J.Archer, M.Archer, G.Archer, A.Bill, J.Chilton, S.Davies (Gate Hangs Well), A.Apati, W.Cairns, S.Goodwin, S.Siviter (Bulls Head), J.Batham, S.Blewitt, K.Bambrick, C.Hart, C.Penzer (Brickmakers Arms), N.Bate, R.Hadley, S.Swingler, S.Tipper (Roost), L.Bird, J.Gennard, R.Lenton, P.O’Brien, S.Priest, K.Wright (Wheatsheaf), C.Bowen, K.Morris (Netherton Cricket Club ‘A’), A.Jones, W.Merrick, S.Purcell, J.Sharratt (Riddins Tavern), D.Tucker (Netherton Cricket Club ‘B’). The Royal, Albrigton staged another of their popular knockouts and winning the top prize of £80 was Pat Pace (Gnosall) who beat Andy Pullen (Ledbury) 6-4 in the final, Pullen collecting £40. In the last four games Pace took out Nik Bloor (Telford) in a close 5-4 affair while Pullen beat Craig Capewell (Pelsall), again 5-4, both losing semi-finalists received £10. Losing out in the quarter finals were Andy Gilbert (Telford), Simon Pritchard (Codsall), Dennis Byles (Ironbridge) and Martin East (Kingswinford). A 5-2 win over the Bull was not enough for ECC ‘A’ to hold on to pole position in the Tettenhall Wednesday Night League as Hurst Hill powered to a 7-0 win at Pilot to give them an average advantage over ECC ‘A’, both teams on an unbeaten eight points from the opening four games.